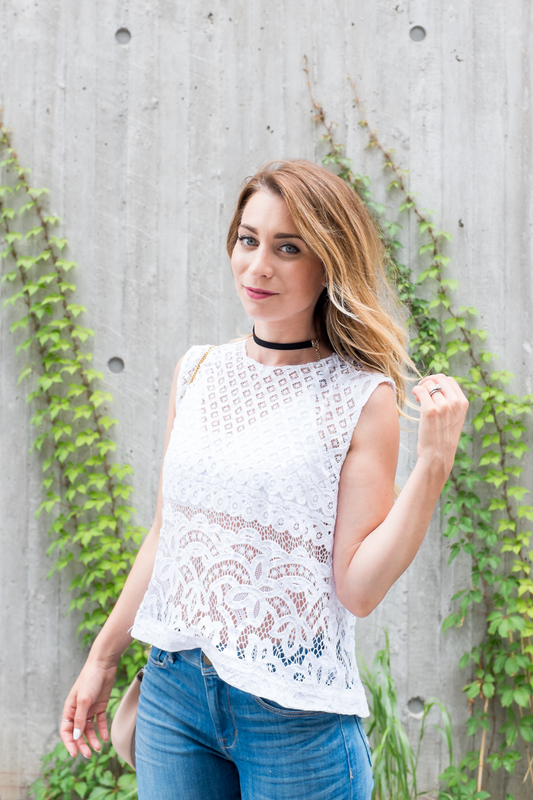 July 2016 | La Petite Noob | A Toronto-Based Fashion and Lifestyle Blog. There really is nothing quite like a good pair of jeans. Typically a dress girl, I tend to shy away from denim (and pants in general) because I find that they never seem to fit, and are uncomfortable. I'm seriously reconsidering my stance, because when I tried on this pair of jeans from Fidelity Denim, I was shocked; soft, comfortable and fit like a glove! Never mind the fact that the legs actually fit without hemming, although it may be because they these jeans are supposed to be a cropped fit - oh well, a petite win! What do you guys think? Is it hard for your to find a great pair of jeans? What are some things that you look for with denim fit? Let me know! For the OG La Petite Noob readers, you will have seen me through my journey of not really understanding the appeal about luxury handbags straight to today, where I can officially say that I'm addicted. I absolutely love the look and feel of a high-end, timeless purse and am slowly amassing a small collection of treasures. Even the process of acquiring a handbag in a boutique can be a luxury within itself, but it is not the only option when building a collection of luxury goodies. Lately, I have come to really appreciate the online luxury consignment market, especially when looking to add the end-all, be-all handbag to my collection: a Chanel. I was lucky enough to test drive this gorgeous, vintage Chanel Kelly bag from my friends at Love That Bag here in Canada. These ladies are my go-to for luxury consignment goods, and for when I'm looking to sell off some of my handbags that I'm no longer in love with (they recently helped me sell my 3.1 Phillip Lim Pashli.) Their prices are also in Canadian dollars, which is awesome for us northerners (and makes their bags an absolute steal if you're shopping from the UK or USA!) Now that I'm on the hunt for my own Chanel, Love That Bag is helping me out big time and hooked me up with some incredible tips for buying authentic, pre-loved Chanel bags. Check out their page for a complete list, but here's a few takeaways that really stuck with me. Chanel started using date codes in 1984. Since then, every bag comes with a sticker containing a serial number as well as a corresponding authenticity card. Date code stickers can usually be found on the inside lining and will vary depending on the year the bag was made. Date codes on newer bags will have a clear sticker with gold speckles placed over the number. Authenticity cards have a gold border. The border of a fake card can be unevenly placed on the card and have a holographic / rainbow reflection. Some authenticity cards will have a white circle in the top right hand corner. This indicates that the bag was made after 2005. Over time, date code stickers can become detached from the bag and authenticity cards can be lost, so don’t worry if either are missing. In terms of the actual serial number, there are a few important things to note: The first number of a date code will indicate which year the bag was made in starting in 1984 with 0. Date codes starting with single digit number are seven digits long while date codes starting at 10 and up are eight digits long. A nine-digit serial number is a clear indication of a fake. Chanel “made in” stamps are usually embossed directly into the lining of the bag or on a leather patch. The colour of the logo stamp will always match the colour of the hardware, so a bag with gold hardware should have a gold stamp. Lettering in Chanel stamps is always clean and sharp. Beware of crooked or messy logos with blurred fonts and uneven spacing. The CC logo is the most recognizable symbol of the brand, and thus good counterfeiters rarely make a mistake with it. However, always make sure that the right C overlaps the left at the top of the logo, and the left C overlaps the right at the bottom. If it seems like it’s too good to be true, it probably is. Remember that an authentic bag will always be made from the highest quality leather and materials. If you are buying used luxury bags from a reputable seller (like Love That Bag), you should have nothing to worry about. Don’t be shy to ask for additional photos or even receipts if they can get a hold of them and use an authentication service. There are authenticators on PurseForum.com that may look at the photos for you. Bottom line is that if it seems to good to be true, it usually is. I like to just purchase pre-loved through a consignment retailer that I trust in order to prevent spending big money on a fake Chanel - that's why I appreciate Love That Bag so much! What do you guys think? Have you ever tried luxury consignment? What handbag is on your wishlist? Let me know! NOTE: This post was NOT sponsored. I just think that a good thing is worth sharing! It seems to be a struggle that most of our generation seems to relate to: how to juggle a healthy lifestyle in today's busy world. We've all been there: waking up with the resolve to start eating healthier and exercising more, only to have the day seem to get away from you and going to bed with a belly full of takeout. I'll be the first to admit that I sometimes neglect making healthy choices that benefit both my mind and body, in favour of taking the easy way out and letting a busy day get the best of me. Lately I've been making more of an effort to live a healthier life, and I'm loving the results; not only in my body, but also the positive results it has had on my mind. I try to take my healthy habits day-by-day, but here is a list of ways that I achieve my healthiest lifestyle. To me, there's nothing more overwhelming than thinking long-term when trying to envision my new healthy lifestyle - I'll just inevitably start to focus on all of the foods and activities that I won't be able to have or do. Instead, I just commit to taking the healthiest decisions that I can every day. For example, when waking up instead of just going straight for the computer I'll choose to instead do a small morning workout. Simple. Same thing goes when making eating decisions: instead of choosing something unhealthy I'll make the decision to go for a healthy alternative instead. Now I know that this will not work for everyone, but for those of us who just seem to get overwhelmed and self-sabotage when thinking long term about healthy living then give this method a try. It has honestly worked so well for me! You guys know that I live right in the heart of downtown Toronto and, as much as I absolutely love it, the hustle and bustle does become too much sometimes. To recharge my batteries and my mind, I love to head to the beach. Seems strange to say, but Toronto actually does have a few small beaches in the downtown core. I like to grab a to-go coffee or tea and head down to Sugar Beach in the early morning to stare out into the water in peace. These particular photos were taken at another downtown beach at HTO Park in Toronto's Waterfront. Whether it's a city beach your family cottage, or even just sitting under a tree in a park, taking the time to rest, relax and recharge in a place that gives you peace does wonders for your mental health, and constitutes to a healthy lifestyle. There's nothing more motivating then incorporating some fun into your fitness routine! I'm always looking for fun classes to try out, group activities and fitness festivals to keep this body moving. Now here's the exciting part. I'm headed to the Lolë White Tour On July 28th at Toronto's Exhibition Place and I want you to come too! The White Tour is an incredible event where thousands of people dress all in white and participate in a sunset yoga-session lead by the country's top yoga instructors. The whole event is devoted to finding inner peace, and it's sure to be an invigorating experience for your body and soul. I have actually been counting down the days for this event, and I can't wait to meet you there! Enter the giveaway below for your chance to WIN 2 tickets to the Lolë White Tour this coming Thursday. This definitely is not an event that you will want to miss. Good luck and hope to see you there! What do you guys think? Do you have your own tips for living a healthier lifestyle? I would love to know! If there was one trend that made me hesitate this spring and summer, it had got to be culottes. I loved the way they looked on others but basically wrote them off for myself, thinking that they were not meant for petites. 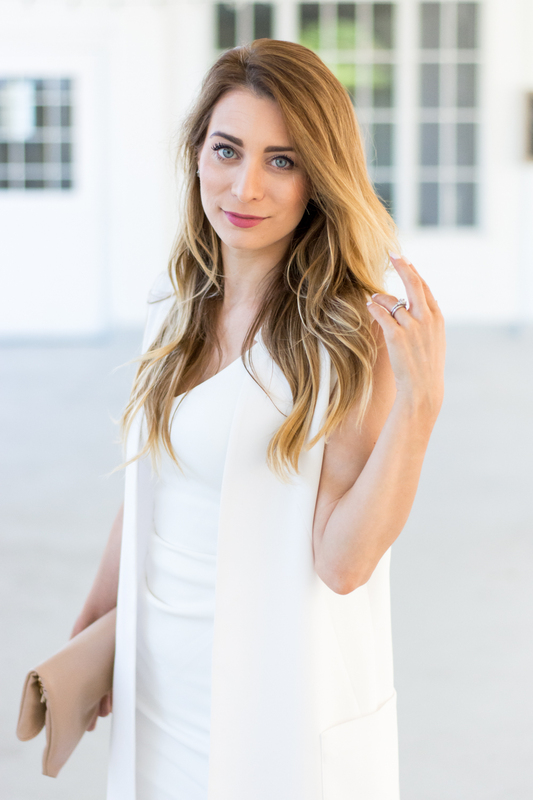 My thoughts changed when I rocked my pink culotted jumpsuit for Toronto Fashion Week, and since I've been on the hunt for the perfect pair of white culottes. My hunt started and finished at Aritzia when I found the perfect pair. I just love the shape of these culottes, and may just need to go back to get another (they come in both grey and black.) Throw on a pair of your favourite heels, and us petite ladies can definitely get behind the culotte trend. What do you guys think about the culottes? Are you into them, or is this one trend that you would rather pass on? Let me know! Yesterday I had a thought about my wardrobe - the colour palette seems to get lighter and lighter with the seasons until we're here, knee deep and summer, and all I can wear is white. Honestly, in Spring it was blush pink and now that July has arrived I have to physically stop myself from buying up all the white clothing in the summer sales. Isn't it funny how the weather can affect us so much, and we see those changes reflected in our clothing choices. Anyways, enough about that and onto the quintessential [white] lace midi dress. Funny story about this dress: it's not actually mine. The lovely Amy of Curated By Amy and I met up to take a few outfit photos for one another (a practice that I highly encourage everyone to do) and I had forgotten a key piece of my second outfit! Being the good friend that she is, she lent me her white midi dress and completely saved the day. 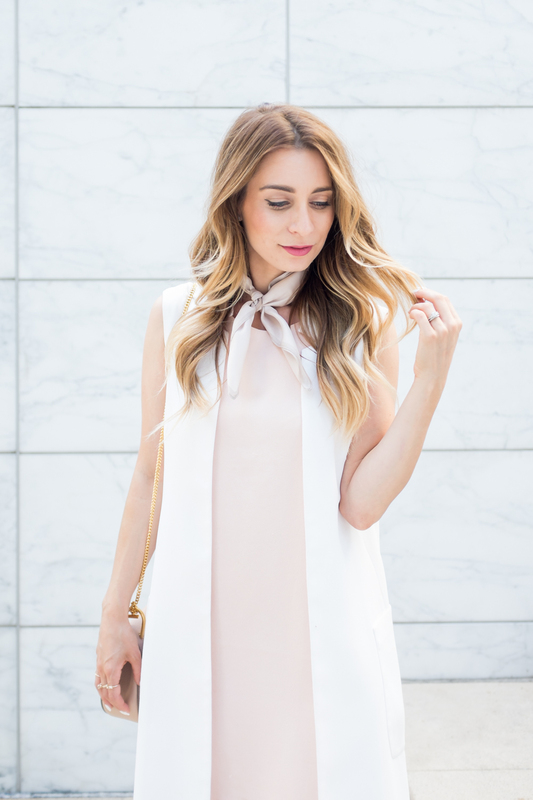 This dress is perfect for summer, and has been seen on some of Canada's top bloggers - and I can see why. The longer hemline of this midi dress makes it an easy wear for warm summer nights, and is enough to make me reconsider my love for the shorter t-shirt dresses. What do you guys think? 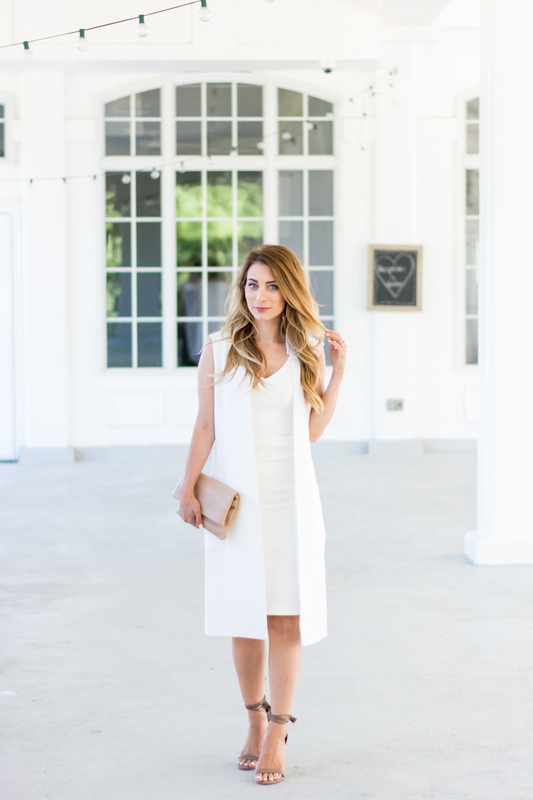 Do you like the length of this white dress, or do you prefer longer or shorter? Have you ever had a photoshoot fail like I did? Let me know!